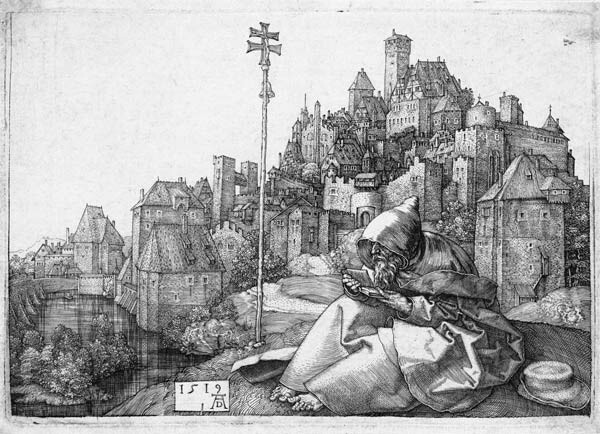 Dürer has drawn him resting by the way . . .
Has he returned from some far pilgrimage? From a dark hermit’s cell? We cannot know . . .
Over his book–and pointed hood drawn down. His eager eyes devour the printed page . . . Rising behind him, with its clustered towers . . .
Look up, and see the world, for God is there . . . Slow to discern the false things from the true! And hungering for eternal certainties . . .
Not knowing how close about them heaven lies! From Inn of Dreams, 1911.